"My grandmother, in the Depression, had five children and not a lot of income. So she had to get up quite early in the morning and make loaves of bread and rolls to sell so that she could supplement the income and keep the family going. My mother would deliver them to the neighbors, still hot out of the oven, with a jar of jam. Now I make my living making bread." Combine the hot water, white sugar, and yeast together in the mixing bowl of a large stand mixer; let sit until it forms a creamy layer on top, about 10 minutes. Fit the mixer with a dough hook, and slowly beat in 3 cups of bread flour and the rolled oats until the flour is thoroughly worked in. Place the mixing bowl in a warm place, cover with a cloth, and let the batter rise until doubled and puffy, about 1 hour. Place the mixing bowl back onto the stand mixer, and pour in the butter; start the mixer on low speed, and beat in the remaining 6 cups of bread flour. Sprinkle salt into the dough. Turn the mixer up to medium, and knead the dough until smooth and elastic, 5 to 8 minutes. Preheat oven to 375 degrees F (190 degrees C). Grease 24 muffin cups. Pinch off about 2 tablespoons of dough, and form into a ball about the size of a large cherry tomato. Place the dough ball into a greased muffin cup; make 2 more balls, and place them into the same cup (3 dough balls per cup). Repeat with remaining dough. 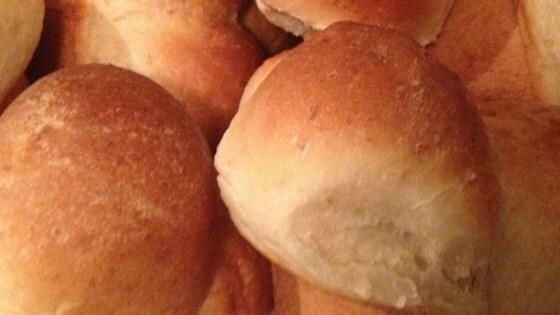 Bake the rolls in the preheated oven until the turn lightly golden brown, 38 minutes. Waaayyy too salty! An awful lot of work to go through with these results.